﻿ Fun Easy English - new american english language vocabulary pictures words dictionary study practice flashcards presentation kids mathematics subtraction one minus number. 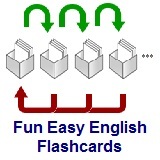 In this lesson you will use flashcards to improve your English. Read the flashcards description, instructions, information, and do the flashcards. This lesson has mathematics flashcards with descriptions in English. Please post a comment below if these flashcards are no longer working.